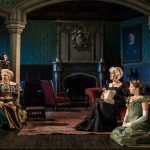 Dominic Dromgoole’s year-long celebration of Oscar Wilde continues with Wilde’s first major play, an attack on Victorian hypocrisy and social mores, which had its premiere in 1892 when it was said that London had not heard such wit since Richard Brinsley Sheridan. 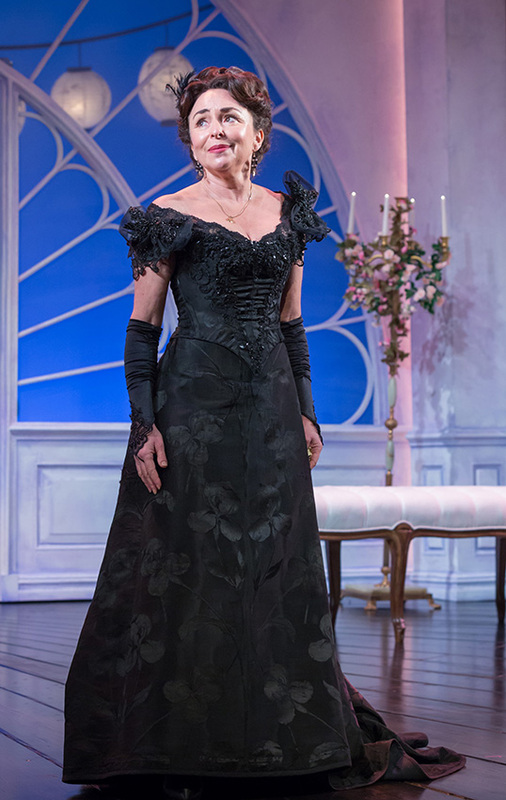 The puritanical Lady Windermere (a portrait of Oscar’s wife, Constance) is convinced her husband is having an affair with the notorious Mrs Erlynne and intends to snub her publicly, not knowing she is her mother. Lord Darlington, quick to take advantage of her unhappiness and naivety, suggests she pays Windermere back in kind and come and live with him instead. 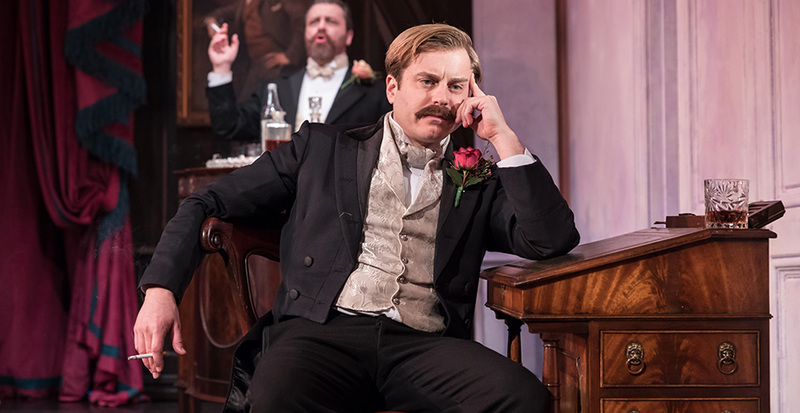 Wilde didn’t want Darlington to be acted for a villain; but then he surely didn’t want him to be acted, as Kevin Bishop does, encouraging loud and inappropriate laughter. 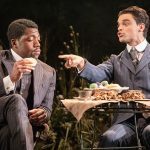 Wilde was going to call the play “A Good Woman” until his mother said the title was too mawkish and nobody could possibly be interested in a play about a good woman. The original title could be applied to either the daughter or the mother; but as Wilde well knew one good action does not make Mrs. Erlynne good. She desperately wants to get back into good society. She needs money. She is willing to blackmail Lord Windermere and marry an old doddering fool. 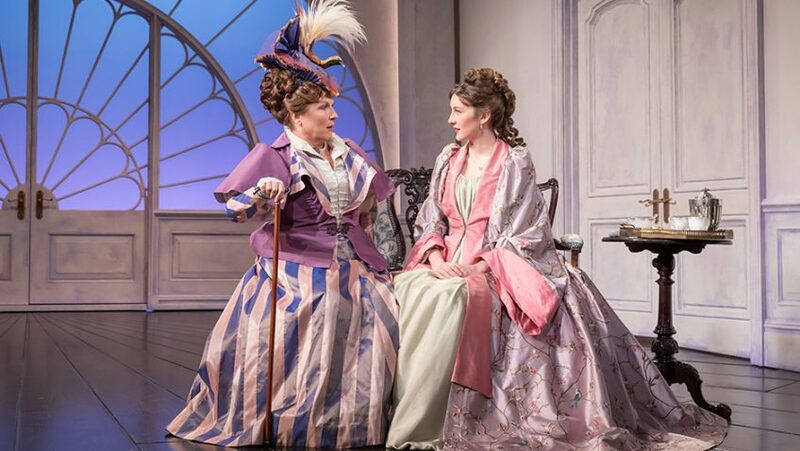 Jennifer Saunders has a lot of fun with the Duchess of Berwick; but the old lady is not just a pantomime silly chatterbox, she is a thoroughly unpleasant mischief-maker, who knows exactly what she is doing when she is spreading gossip and scandal. 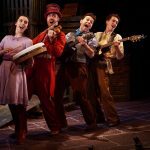 The audience found it very difficult to take the melodrama seriously on the press night. But then there is so much miscasting and inadequate acting and misdirection by Kathy Burke that Wilde isn’t served as well as he ought to be. Samantha Spiro as Mrs Erlynne gives one of the better performances. Paul Wills’s set doesn’t help, lacking gravitas. It is too light and bright and airy. The play needs solid furniture. The pretty fan-shaped window and the creamy walls would be more suitable for farce. The actors do not look real in it. The one scene which works is the one when the men are swapping epigrams late at night in Lord Darlington’s furnished rooms; but then this scene, too, is also ruined by playing the melodramatic climax for silly farce.